President Armen Sarkissian, who is in France on a working visit, on September 22 participated at the annual Summit of Minds in Chamonix. Three hundred participants from 28 states conducted multifaceted discussions on the expansion of investment opportunities and strategic decisions in the contemporary world and related human factor. They spoke about the global macro trends, their impact on investments and economic strategy, as well as the adaptability to the speed and instability of today’s and tomorrow’s world and opportunities to use them. Speaking at the Summit as the keynote speaker, President Armen Sarkissian presented his viewpoint and approaches on the topics under discussion as well as on the events and challenges existing in today’s world. 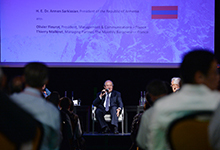 President Armen Sarkissian, who is France on a working visit, participated at the Summit of Minds in Chamonix as the keynote speaker. Constructive discussions unfold in the relaxed atmosphere related to the trends of development of the global economy, investment opportunities and challenges of the contemporary world, on leadership and strategic decision making. Approaches and ideas of President Sarkissian were accepted warmly by the participants. At the meeting with the organizers of the Summit, the President of Armenia reached the agreement to organize a similar summit in Armenia, in particular, in the areas of a healthy lifestyle, processing of agricultural produce, and other areas. The President of Armenia discussed with them the business climate in Armenia as well as issues related to investment attraction and creation of business ties. President Sarkissian introduced the competitive advantages of our country, underlined the country’s role as a bridge between the EU and the Eurasian Economic Area which opens new and significant opportunities. At the meeting, an actual agreement was reached on the implementation of certain programs in Armenia.